I know I rock making little boy stuff for the Monster. I know because I try REALLY hard to make it easy for other people, to inspire them that little boys can wear rad things too! When I had him I was so disappointed that the stuff available in the shops was neither stylish nor very rad at all. So for the last 3 years, it's all been boy-focused. As you can see from the photo above though, I may or may not be having WAY too much fun making stuff for my daughter. I do feel guilty! This weekend I've knocked out about a dozen little pieces for her. It's so EASY and so little. I really have to make sure I balance stuff out with the Monster too, but he's got 3 years of handmade goodness on her so I shouldn't be feeling guilty! I was so anxious, so terrified of making anything for a little girl. Much like when I was pregnant with Monster, I didn't actually sew anything until after he was born because I had no idea what shape a baby was, how big my baby would be, would the clothes I make him sit okay on him? Lucky for my living Doll, I've now had three years practice on her big brother! I was still anxious though. I'd never made a tiny dress before! 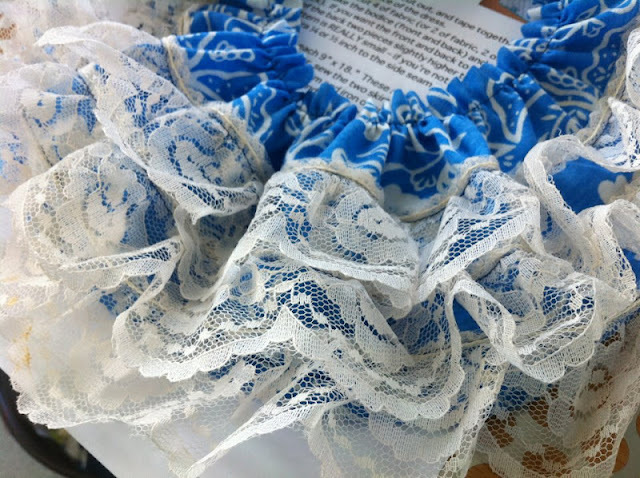 I'd never made anything with an obscene amount of ruffles! To the rescue comes Rae, of course. One of my top 2 favourite DIY blogging mamas. I'm serious. 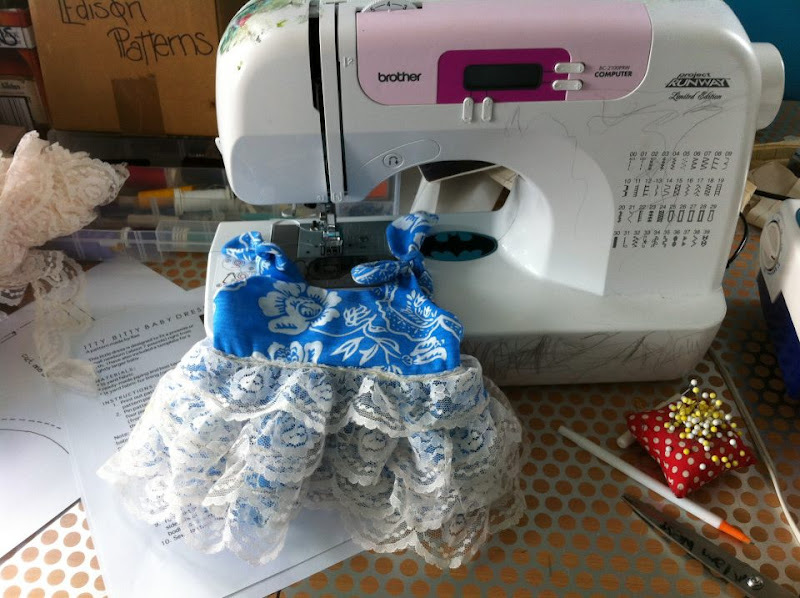 Between her and Dana, they inspire me and motivate me to sew better, to share more with you. One day I'll be up there with them *dreamy face*. Rae had on her blog a tutorial and pattern I'd never looked at. It was for a GIRL. A BABY GIRL. A species I was totally not familiar or interested in. I seriously thought I was going to be like Tim's mother and have three boys. Yep. It was my job in the family to have the boys, and everyone else would have girls. I don't know WHY i thought that, that's just the way it was. Why would I be lucky enough to have a boy AND a girl? The best of both worlds! That's too perfect! 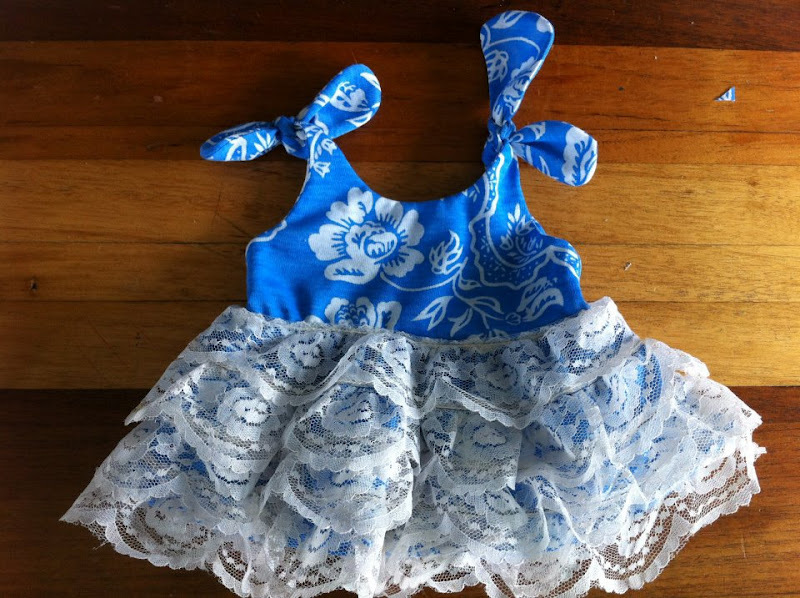 Thanks to Rae's Itty Bitty Baby Dress, I had a free pattern to download, print and try out. And you know what? I was brave enough to branch out from it! I didn't even make the dress in the pattern! I made the bodice section up as instructed. Using a t-shirt I was embellishing as a guide, I made a gathered skirt for the bodice, it's shorter than the tutorial, but I wanted it like a short tunic length. Then I went nuts with layers and layers of vintage lace I had sitting at the top of a shelf in the studio. LAYERS AND LAYERS. Look at that. Isn't it ridiculous? And to show you just how tiny this dress is! This dress will fit her if she is the same size Monster was at birth, 8lb 4oz. If she is any bigger, it's not going to happen. Unless she's long and skinny. I'm a bit excited to see! And then of course, what happens in the blogging world when you google search hard enough, you will find more free tutorials and patterns. Thank you to Dana, I was able to make a diaper cover to go underneath this ridiculous little dress. I added lace across the bottom because I have discovered, when it comes to little girls - there's no such thing as too much lace! Too cute Max! really love it. SO CUTE, SO RUFFLY! Man, your baby-clothing making makes me so clucky, lol.